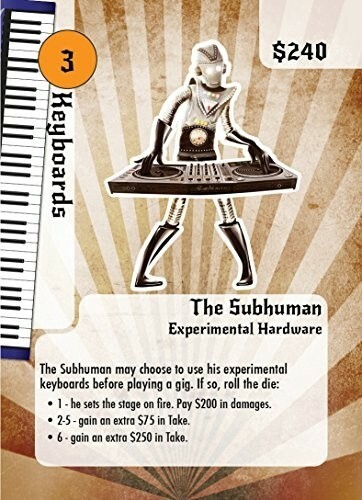 CHOPS allows you to build bands. With your band, you visit rock and roll venues. Playing gigs pays in cashola and your band's BUZZ grows with each gig. While your friends wasted time on paltry endeavors such as getting good grades, preparing for college, holding down jobs, and listening to the man, you answered a higher call: the call of ROCK! After spending every waking hour of your formative years learning to play, it's time to cut the apron strings and strike out. Question is: do you have the CHOPS to become a superstar? Hire musicians, build bands, and play gigs for cashola and, even more importantly, BUZZ. But be careful, Rock can be dangerous. 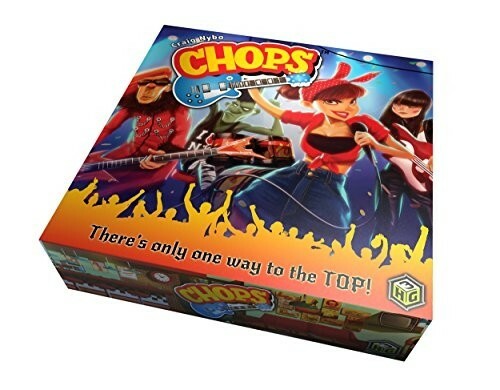 CHOPS comes with a game board, 112 hilarious cards, plenty of rock and roll cashola, a whole slug of BUZZ guitar pick game pieces, and a rule book. Lets face it, everyone wants to be a rock star. 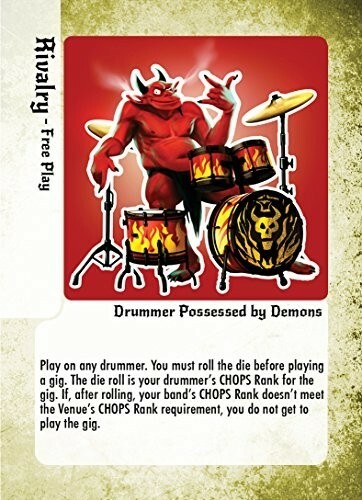 Now you can live out your rock and roll dreams with CHOPS, a 3 Headed Giant Game. CHOPS is part of an enormous alternative rock and roll universe. You can immerse yourself into this rock and roll world even more by downloading CHOPS the soundtrack for FREE. 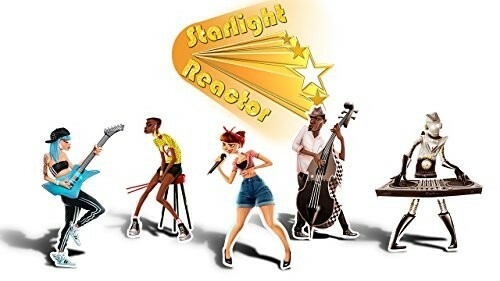 The album features music written and performed by musicians and bands in the game. 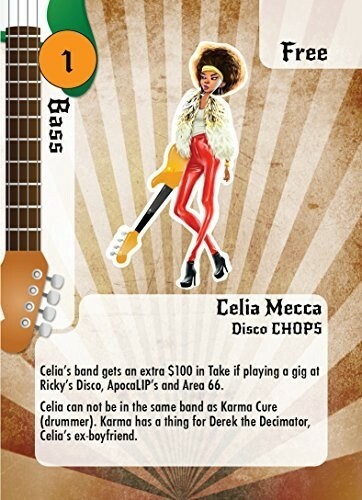 CHOPS allows you to build bands by choosing from over 35 musicians. With your band, you visit rock and roll venues such as The Bucket of Blood, The Leather Unicorn, Area 66, and TornaJoe's to play gigs. 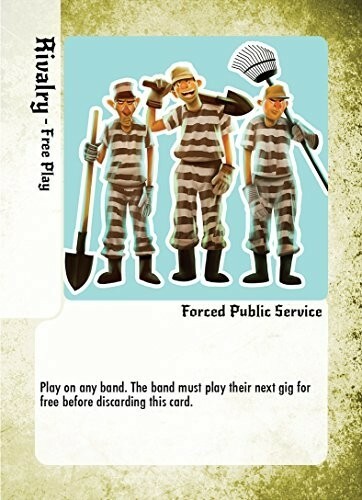 Each venue has its own special rules that can effect your band. Playing gigs pays in cashola and your band's BUZZ grows with each gig. BUZZ is represented with guitar pick playing pieces. 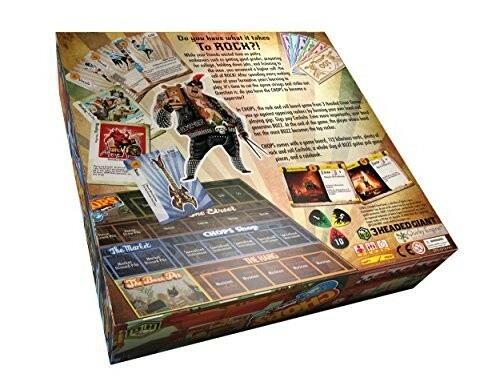 The game is hilarious with just enough strategy to keep it interesting yet light enough to keep it social.